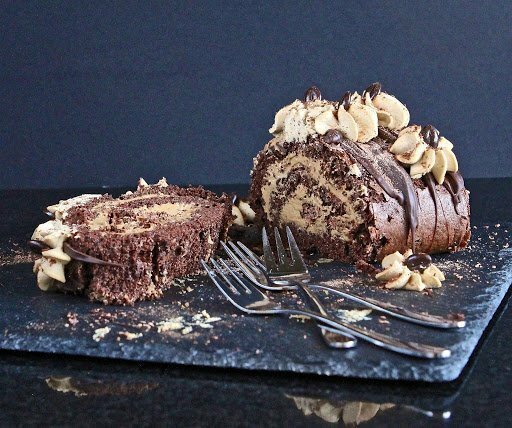 A lip smacking chocolate log isn’t just for Christmas. It’s also a great cake to mark both St Valentine’s Day and ten years of blogging. 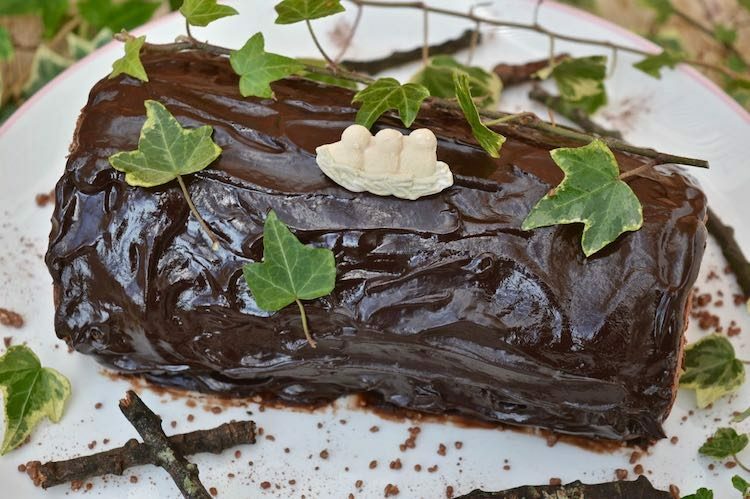 This celebratory chocolate log is a brilliant way to share the love. It looks a bit special and is made from rich dark chocolate, seasonal blood oranges and red strawberry jam. 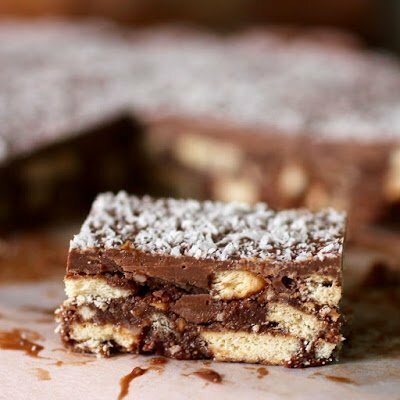 In honour of the occasion, I also have ten favourite chocolate recipes from some awesome food blogging buddies. My very first post was called Cut the Chocolate Log. 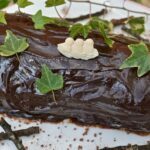 It wasn’t a recipe post, just an introduction to my blog, Chocolate Log Blog, as was. Ten years on, I finally have a chocolate log to cut. I like to do things dreckly. 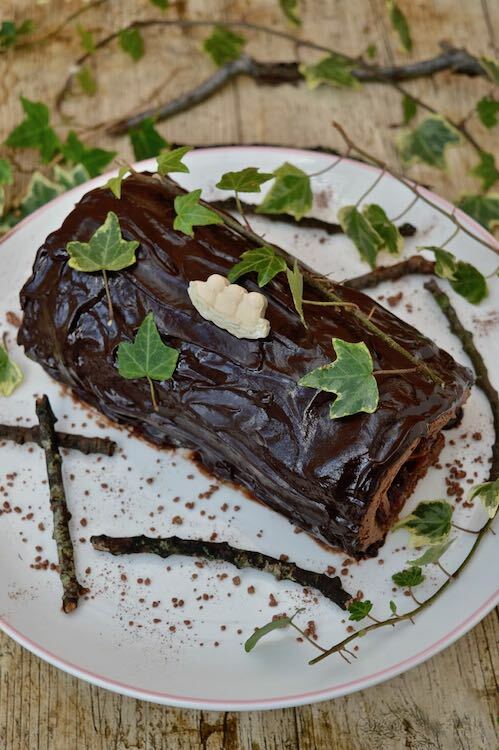 A chocolate log may look like something that should be wheeled out at Christmas. Indeed this one would make an excellent yule log for festive occasions. Look carefully, however and you’ll see some birds nesting on my log: it’s a spring chocolate log. 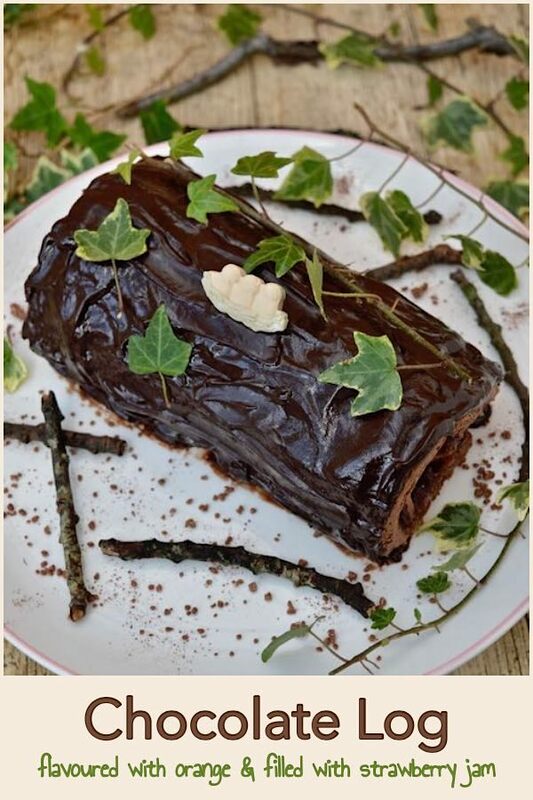 In my book, a chocolate log makes for a good celebration cake at any time of the year. 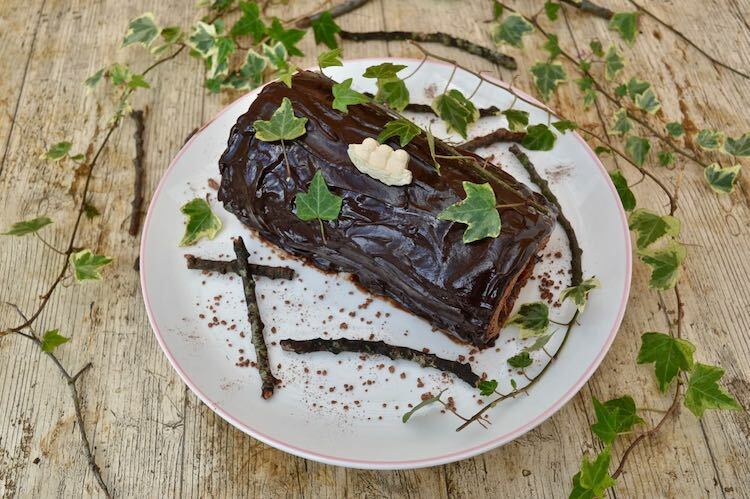 This chocolate log is a light chocolate sponge, flavoured with seasonal blood oranges. It’s filled with homemade strawberry jam and is covered with an orange flavoured dark chocolate ganache. It’s delicious. Roll out the roulade. Yes, this chocolate log is a bit fiddly to make and no my rolling abilities haven’t improved much over the years. But this is one fabulous cake and it’s well worth making. The flavour is robust and the cake’s not overly sweet. The chocolate ganache is rich and unctuous and the orange notes shine through. Despite the wholemeal spelt flour, the chocolate roll is wonderfully spongy. I’ve a few tips for you that you can find below, but for the full recipe you’ll need to scroll to the bottom of the post. Please do let me know if you try it and what changes, if any, you made to it. WARNING If you feel tempted to eat the ivy, please don’t. It’s poisonous and is used in the photos for decorative reasons only. Add a little water to the sponge mixture, it helps make it more pliable. Ensure you have the right size baking tin so that the sponge isn’t too thick to roll. Don’t over bake the sponge as this will make it more likely to break. Cover with a damp tea towel whilst the sponge is cooling after baking, so it doesn’t dry out. If the sponge does break up a bit, tell no-one and cover with ganache or buttercream and no-one will be any the wiser. It’s fine to use cream as the filling instead of the jam, or even as well as the jam. The chocolate log, however, will need to be eaten within a couple of days of making it. It will also be a bit more difficult to roll as the cream is more likely to squidge out of the sides. Don’t Like Dark Chocolate Ganache? If you prefer something sweeter and less rich, you can easily swap milk chocolate for the dark chocolate. 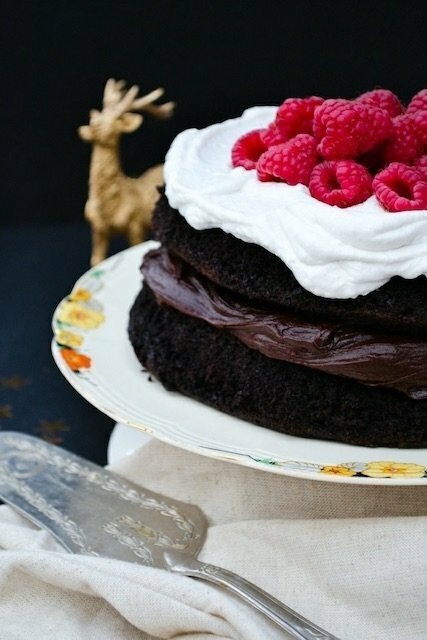 Other options include a chocolate cream cheese icing as in this fudge cake recipe or a classic chocolate buttercream as in this chocolate layer cake. Although if you use this last one, you might want to leave out the coffee. Leaving the orange out of this recipe won’t hurt it at all. You can use vanilla as a flavouring instead and just swap water for the orange juice in the ganache. Alternatively you could use coffee and turn it into a mocha chocolate log. To mark my ten years of chocolate blogging, I asked some of my old chocolate blogging buddies from We Should Cocoa days for their favourite chocolate recipe. There’s also one from me. 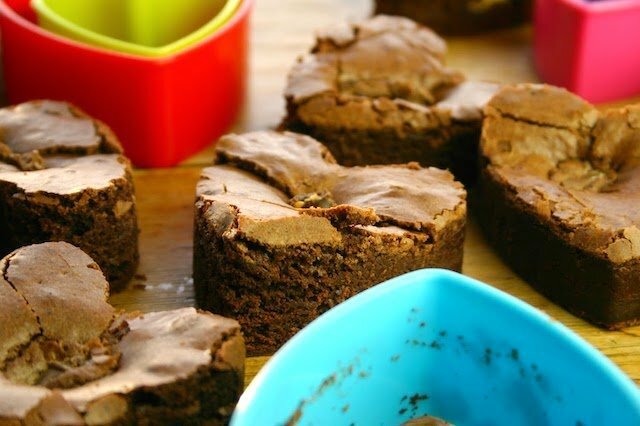 Of course, it’s terribly difficult to pick a favourite from a whole host of chocolate recipes. Most of us, however, have one that stands out just a little bit from the others for one reason or another. So crucially, I wanted to know why my friends had chosen the one they did. 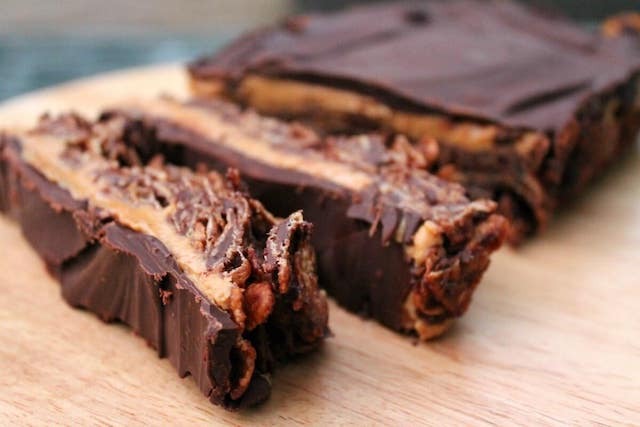 This recipe for how to make your own chocolate bar from scratch may not be my favourite to eat, but it’s the one I feel most proud of. I really didn’t think it was possible to make chocolate at home unless you had all sorts of fancy equipment. But all you really need, it turns out, is a decent blender. Jac from Tinned Tomatoes was one of the very first people to comment on my blog way back when. She wasn’t able to pick a favourite when I asked, so I’ve done the choosing for her. 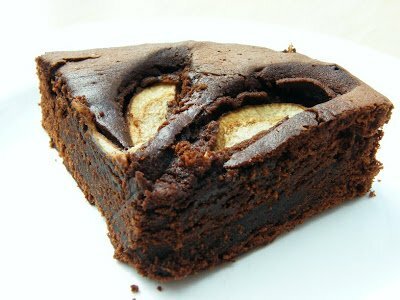 The photo of this chocolate pear cake has lived with me ever since I first saw it, nearly eight years ago. 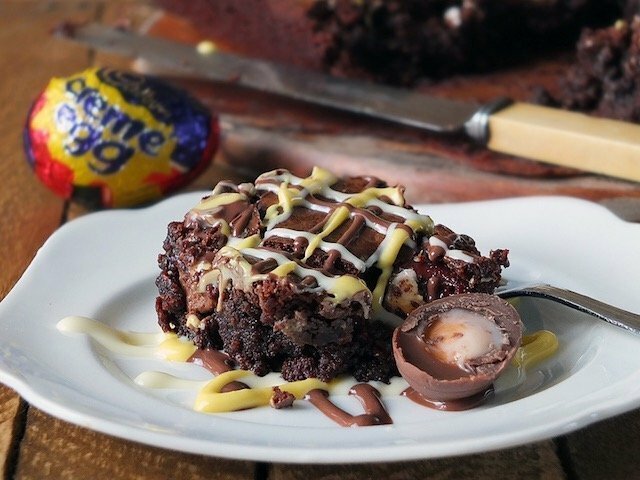 It just looks so very fudgy. I’m linking my blood orange chocolate log up to #BakingCrumbs with Apply To Face Blog, #CookOnceEatTwice with Searching for Spice, #BakeOfTheWeek with Mummy Mishaps, #LoveCake with JibberJabberUK and #CookBlogShare with Everyday Healthy Recipes. Thanks for visiting Tin and Thyme. If you make this blood orange chocolate log, I’d love to hear about it in the comments below or via social media. 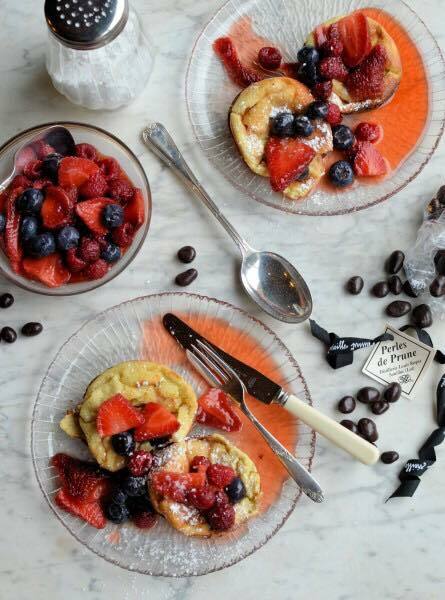 Do share photos on your preferred social media site and use the hashtag #tinandthyme, so I can spot them. For more delicious and nutritious recipes, follow me on Twitter, Facebook, Instagram or Pinterest. Blood Orange Chocolate Log. PIN IT. This classic chocolate log is flavoured with orange, filled with strawberry jam and covered with a rich orange chocolate ganache. Turn the oven on and set it to 190℃ (375℉, Gas 5). Line a 20 x 30 cm tin with baking paper. Whisk the eggs, sugar, salt and orange zest together with electric beaters until the mixture has tripled in volume and is thick, pale and almost mouse-like. This takes around 5 minutes on high speed. You can do it by hand, but it will require some elbow grease and take longer. Fold in the warm water with a large metal spoon, then sieve in the flour and cocoa powder. Fold in carefully, so that you don't loose too much air, until everything is just combined. Scrape the mixture into the tin, then spread it with a knife until it's filled the corners and is even. Bake in the middle of the oven for 8 minutes, or until well risen and springy to the touch. Place the tin on a wire rack. Cover with a damp tea towel and leave to cool. Whilst the sponge is cooling, break the chocolate into a bowl. Add the honey and 25 ml of the orange juice. Place over a pan of hot, but not boiling, water. Leave for a few minutes until the chocolate has mostly melted. Remove from the heat. Bring the cream to a near boil in a small pan, then pour over the chocolate. Stir from the inside out until everything is melted, smooth and combined. Leave to cool for a few minutes. Turn the cooled sponge out onto a clean piece of baking paper and peel off the original piece. Add a teaspoonful or two of the orange juice to the strawberry jam and stir to make it a good spreading consistency. Be careful it doesn't become too runny. Spread this over the sponge, making sure you leave a small gap around the edges, so that it doesn't all squidge out when rolled. Using the baking paper to aid you, carefully roll the sponge up lengthways. Spread the ganache roughly over the roll, so that it resembles tree bark. Leave the ends clear. If you prefer, you can use a fork to roughen the surface up. Leave for an hour or so for the ganache to set. The cake should last for 4-5 days if kept in a cool place in a sealed container. WARNING If you feel tempted to eat the ivy, please don't. It's poisonous and is used in the photo for decorative reasons only. Congratulations on 10 years of blogging. I loved being part of We should Cocoa and those early days of blogging. It was great to meet you a few years ago. So much has happened in those 10 years. I’ll raise a glass to the next 10 years of Tin & Thyme, cheers! Thanks Janice, cheers. It was lovely to meet you too. Can’t believe quite how long ago that was either. Yes those early link-ups were fun. So many blogs have fallen by the wayside, it will be interesting to see how things go over the next few years. Congratulations on your blog’s tenth birthday! I always enjoyed taking part in We Should Cocoa, and finding out the theme for each month. Your “spring roll” looks and sounds delicious, a great way to celebrate the arrival of Spring! Thanks Lucy and thanks for joining in with WSC too. I know it’s not really spring yet, but there are hints of it. It’s my absolute favourite time of year. Where do all the years go? That’s dhat I want to know. Nice selection and thanks for including one of mine. Sorry I meant two of mine. No idea Jac, it doesn’t seem so very long ago. When I think of chocolate cake, that pear cake photo of yours always springs to mind. I loved We Should Cocoa and all the old blog challenges. And challenges they were….. they formed the basis of my monthly creativity and always welcomed fun into my kitchen. They were never about improving rankings and were definitely in the realms of ‘old school’ blogging. I loved that! Oh Lovely Kate. Thank you for saying that. I loved being challenged too and how enthusiastically everyone used to take part. It’s quite unthinkable now. So glad you’ve taken to kefir. Ours was put to bed whilst I did Veganuary and it’s about time I tried to revive it. I had to have one of your lovely creations and it’s always good to include something that’s gluten-free too. Your roll looks gorgeous. Blood orange for me and mocha for CT please. That chocolate log looks wonderful and impressive – it is the sort of thing that intimidates me. Actually I never realised why you called your blog “chocolate log blog” – I had thought it meant a log of your chocolate recipes. Now it makes sense. Congratulations on 10 years of blogging and all the wonderful posts over that time. I still miss We should Cocoa but feel like this round up of favourite chocolate recipes is a little WSC blast from the past with lots of familiar names and even a few familiar recipes (I loved Jac’s chocolate pear cake photo too). Here’s to another 10 years! Intimidate you Johanna? That made me laugh with all your wondrous creations. Chocolate log blog was meant to cover several bases and being a log of my chocolate recipes was definitely one of the reasons for the name. I’ve been feeling really nostalgic about WSC recently as I’ve been ploughing through lots of my old posts. 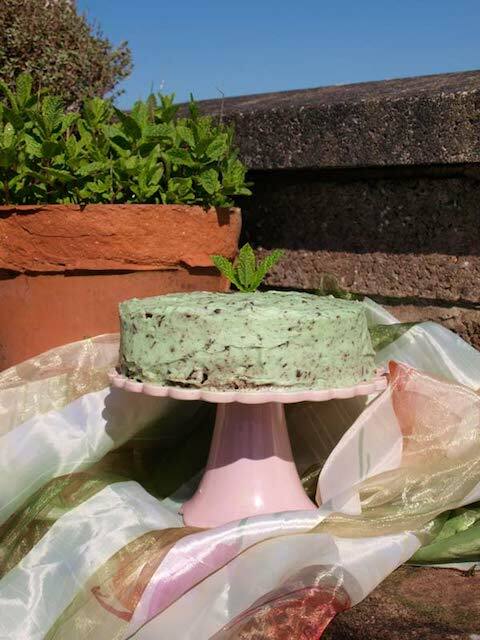 What a gorgeous recipe and a great way to celebrate 10 years of blogging! Happy Blogiversary! I loved all the old challenges and remember I used to plan what to make at the beginning of each month depending on what the themes were. 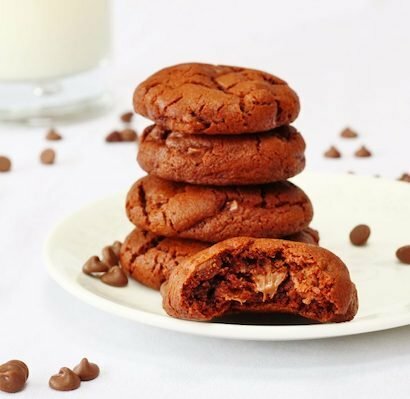 Thanks so much for including my chocolate chip cookies and for sharing with #CookOnceEatTwice! Thanks Corina. It was fun having a theme and seeing what everyone else came up with. Thanks so much for being a part of it. And for your gorgeous cookie recipe too. 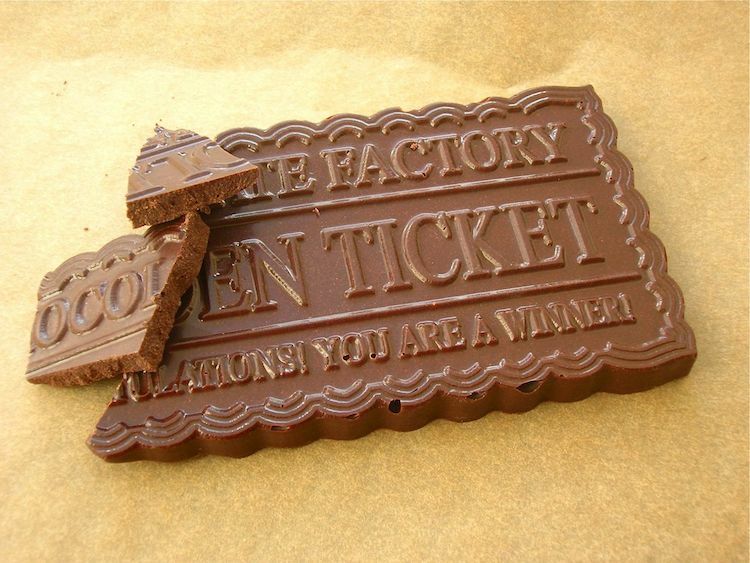 Happy 10th Blog birthday, I loved ready the entry’s to the We Should Cocoa, linky even including my own, when I entered, which seems ages ago! How lovely to hear from you Nic. Thanks so much for your well wishes. I do miss We Should Cocoa, though not so much the work involved. Congratulations! I really enjoyed reading this post, I do miss the old days of blogging and that fabulous feeling of community and recipes shared. Onwards into the next decade, I wonder what it will bring! Thanks Chris. It’s a very different world now for sure, so it will indeed be interesting to see what the next ten years brings. A perfect chocolate cake for the celebration, Choclette! Congratulations!! Thanks Angie. It’s only taken me ten years! Thanks Karen. I met you and so many other fabulous bloggers through We Should Cocoa. And of course I remember the Cheltenham meet up. It was fun and so good to meet in person. I expect that was already far longer ago than I remember. Happy 10 years! Such an amazing achievement! Thanks very much Kat. I’m sure you won’t be too far behind. Happy blogaversary! Where has the time gone! I really enjoyed this post; it brought back all sorts of We Should Cocoa memories, and encouraged me to visit a few blogs I hadn’t visited in a long time! Gorgeous cake too; a very fitting tribute. 🙂 Here’s to the next ten years! Thanks Elizabeth. This post has been a real trip down memory lane for me. I’m glad you enjoyed it too. Congratulations on your 10th year!!! This is exceptional work… and shockingly I remember nearly most of it! Shocking is the word. I mean TEN years – that’s a whole decade.What? Always loved your contributions and Random Recipes too. The recipe is ace, I love combining chocolate with fruit! A great recipe for celebrating a decade of blogging! Congratulations and thank you for sharing with #CookBlogShare! Thanks Monica. I’ve got a thing at the moment for chocolate and blood oranges. Thanks Jo. There is something very special about the combination of chocolate and orange for sure. Thanks Jenny. It was interesting to find out what those favourite chocolate recipes were all about. Thanks Camilla. Who’d have thought I’d still be going ten years later. Not me for sure. I know you can’t see the blood oranges, but they somehow imbibe the cake with something a little bit special. What a wonderful selection of recipes to celebrate 10 years of blogging. I’ve been scrolling up and down trying to decide on my favourite. 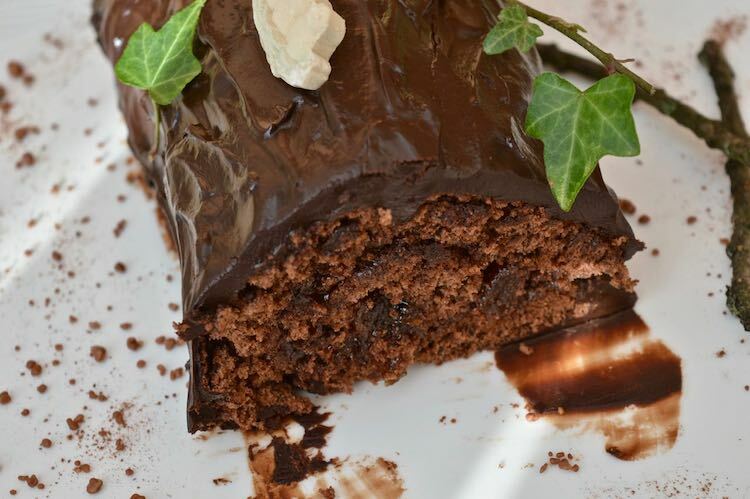 What a gorgeous looking chocolate log – your chocolate orange ganache is so glossy and scrumptious! I also enjoyed reading your tips for rolling a log – it always makes me nervous when it is my time to roll the sponge! Thanks Jenny. I could definitely do with being a bit more adept at log rolling. My besetting sin is patience – or rather lack of it. Yay Helen. Glad to see you back. I’ve just added in an entry. I don’t think there are many of us left now who stated around that time, so I’m doubly glad to har you’re not giving up blogging.